First build a frame out of 1x3's the size and shape you want the fireplace to be. This one is made in three pieces, the hearth is a box made from 1x3's laying flat with mitered corners measuring 4'-6" x 2'-0". I then cut a piece of luan the same size, stapled and glued it down over the fram and added some intermediate members so if you walk on it it won't flex. The firebox was another box that was 4'-0" wide, 3'-9" tall, and 4 1/2" thick. I built two frames for either side, and then a couple of 1x3's ran from frame to frame to create a box. make sure all the connecting 1x3's are hidden in the upper portion. Then secure a piece of luan across teh whole thing and cut an openning where the fire would be seen. The last section was the top back. it was 4'-0" wide, 4'-0" tall, and 1" thick. 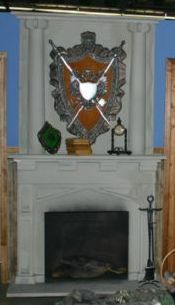 Like the hearth, built flat with mitered corners. Then a piece of luan attached over the whole frame. 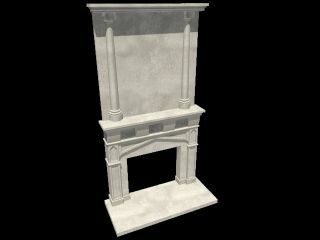 You should now have a wooden frame that you can form up into a rough looking fireplace. After it's all assembled, you can add foam trim , or wood trim to build up posrtions of teh fireplace to make it look more elaborate. I used a foam cutter to add details to certain pieces of foam like the ones on either side of teh firebox and the triangular areas above it. the columns were a lucky find at a foam place, they are half columns that tapered towards the top and were exactly what we needed. If you can't find something similar, you coudl use a heavy cardboard and curl it liek you would for a cone. once all the foam is cut, sanded, and glued on, spray each major section with some ground coat adhesive, or some other such hardening compound that gives it the look of stone. You coudl make this entirely out of lumber and stain it too if you want the look of wood. To make your fireplace come to life, you can add a fog machine and some wood with red twinkle lights hidden inside it to look like glowing embers. Just hollow out the back side of the wood, and then take black spray paint, and mist it on around the area where the hole is cut out, and then spray it heavy inside the hole. You could even go as far as to saw notches in the wood near the hole to give it the look of burnt wood that is about to become ash. Just look at some real wood that has been burnt, or even get some and use that. It will be a lot messier though since all the ash will get everywhere.